Conquest Top Gun made every pole a winning one under a confident ride by Eurico Rosa da Silva in Sunday’s $148,250 Victoria Park Stakes for three-year-olds, at Woodbine. Trained by Mark Casse for the Conquest Stables of Ernie Semersky and Dory Newell, Conquest Top Gun repelled a challenge at the top of the lane from Keen Gizmo in the 1/8-miles ‘Poly’ tilt before coasting home a 5 3/4-length winner. 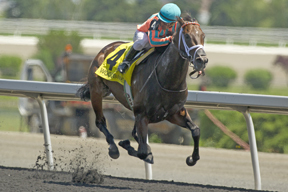 The victory capped a good weekend for Conquest Stables at Woodbine which included a stunning first stakes score by Conquest Tsunami in Saturday’s Victoria Stakes for two-year-olds. “We love it here. Our first year we bought one horse and since last April we’re now up to 60,” said Semersky. Semersky places their success at the hands of Casse, a five-time Sovereign Award winner as the nation’s top trainer. He returned $2.70 pairing with Keen Gizmo for a $13.80 (4-1) exactor.